We have a very cool show for you this month with groovy stuff from Glad, the Sandals, country from Johnny Darrell, pop from the Lemonade Charade, Joey Heatherton, Ray Stevens and cool instros from Impact of Brass, Herbie Mann and the Phoenix Authority! So dig it, and I’ll see you all next week. 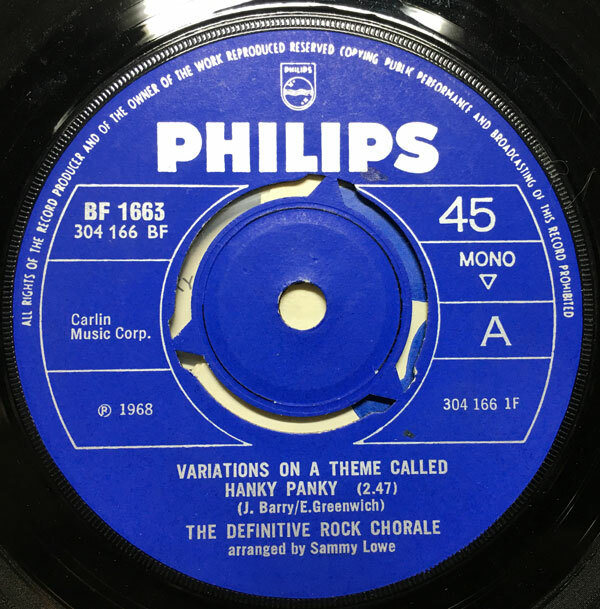 The tune I bring you today is one of those tracks that I first encountered on a CD back in the day and had to track down on vinyl, eventually finding an Italian issue of the 45. 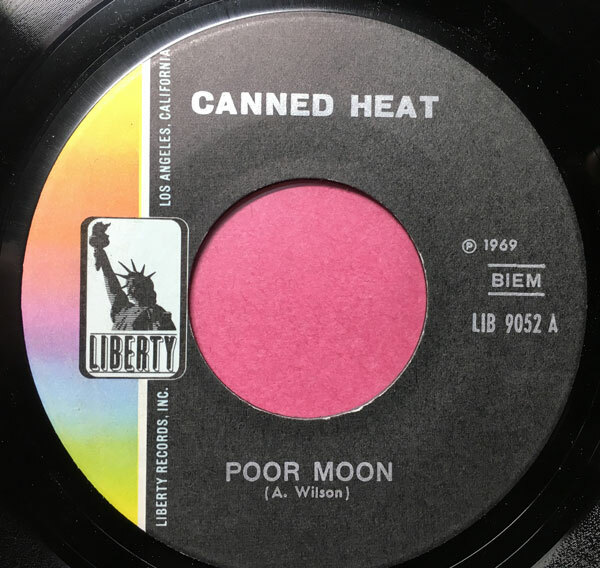 The song in question is one of the finest examples of Canned Heat’s far-out-itude, ‘Poor Moon’. Recorded around the time of the album ‘Hallelujah’, yet only ever being issued as a 45 track, (flipped with the ‘Hallelujah’ track ‘Sic Em Pigs’), ‘Poor Moon’ is Al Wilson’s look at what might happen to the (actual) moon were it to be misused by earthlings as a nuclear test site/and or garbage dump. 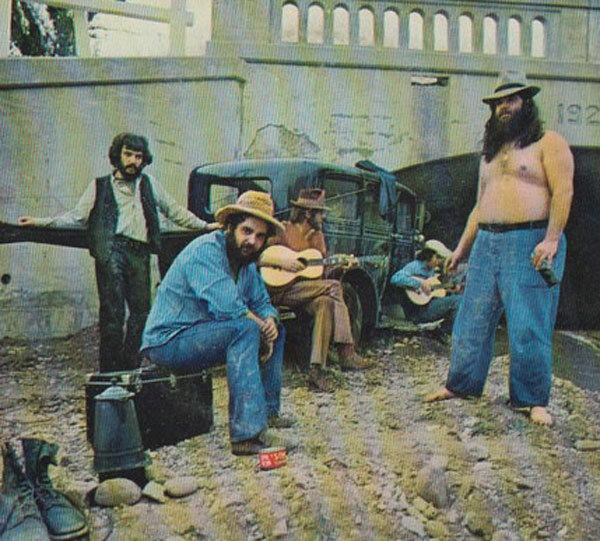 What is especially groovy about ‘Poor Moon’ is the fact that it initially gives off a psychedelic vibe (it is wonderfully stoney, no matter what) but when you dig in you realize that what your listening to is an old-school blues drone with a little bit of amphetamine fortification, which, of course, Canned Heat was especially good at. I hope you dig it, and I’ll see you all next week. 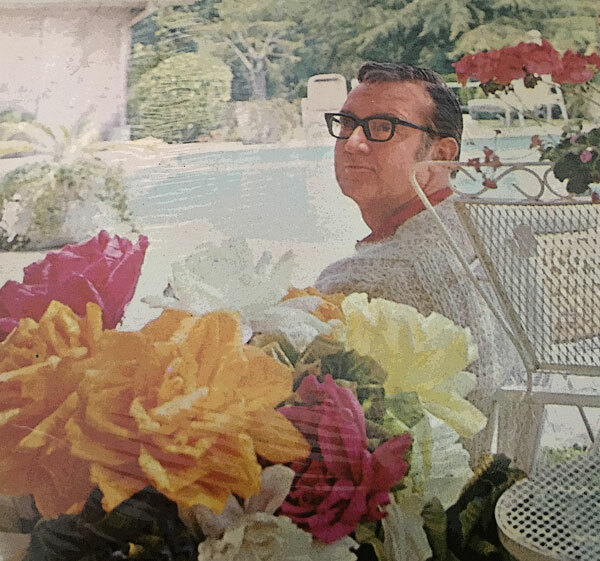 Steve Allen, coming down by the pool after a night of tripping his balls off. Today’s selections serve as both a reminder to dig deep into those discographies, as well as a short-form memorial (more to come soon) to the mighty Hal Blaine. A while back I was searching in the back alleys of the windmills of the Dunhill discography and discovered that no less a light than Steve Allen had recorded for the label. 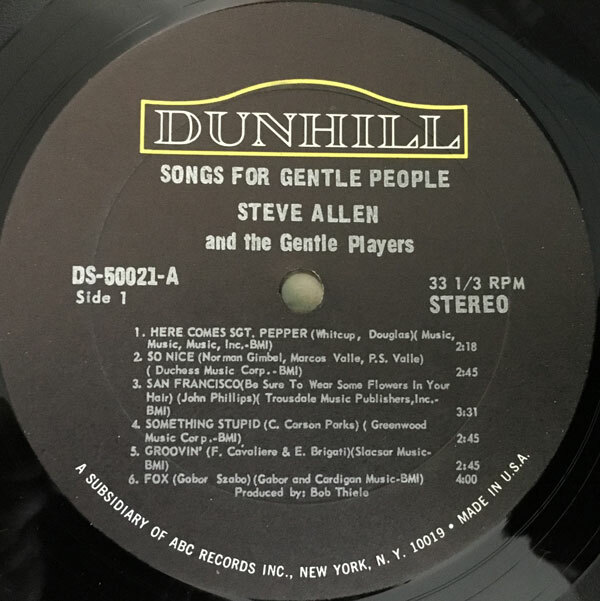 I checked out the album, credited to ‘Steve Allen and the Gentle Players’, took one look at the song titles/credits, and saw that the only other musicians credited were Gabor Szabo (high on my list of ‘buy anything you find by…’ ) and the mighty Hal Blaine. I pulled the trigger, and when the album finally made it under my phonograph needle, I was very pleasantly surprised. 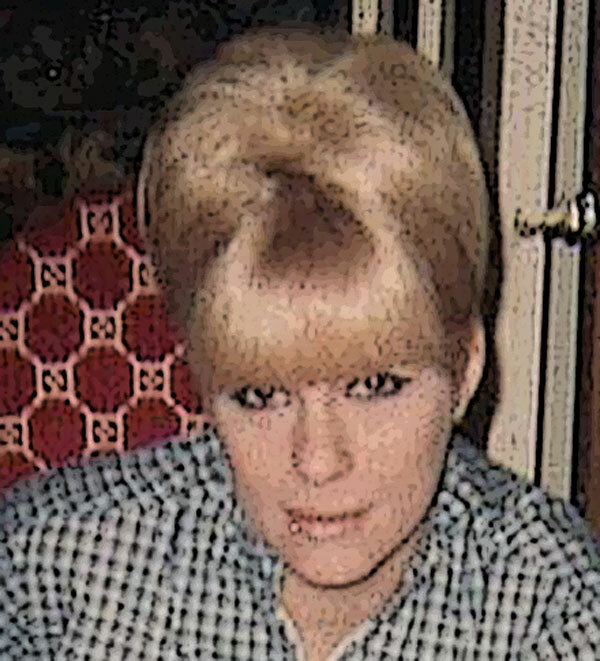 The record – and I’m going out on a charitable limb by assuming that Steve was playing piano here – is a very cool take on soft pop au go go with minor jazz filigree, featuring not only a bunch of contemporary covers, but also several Szabo originals. The feel is fairly close to the Impulse sessions that Szabo was doing with Bob Theile (who produced this session), minus the vocal contributions of the California Dreamers. The two tracks I bring you today, ‘Fox’ and ‘Flower Revolution’ are very groovy indeed. ‘Fox’ is the same song as ‘Are You There’ on Szabo’s ‘Wind Sky and Diamonds’ (that version, recorded the same year features vocals by the California Dreamers). The instrumental version is a tiny bit trippier, sounding like hip background music from a period film. ‘Flower Revolution’ has a slightly more upbeat take on that particular vibe, sounding like it was created as background music for a discotheque scene. The rest of the album veers from stuff like these tracks to more the more ‘easy’ feel of ‘Here Comes Sgt Pepper’, and Blaine is dependably in-the-pocket. Though the album doesn’t turn up too often, it’s inexpensive when it does, and comes highly recommended. 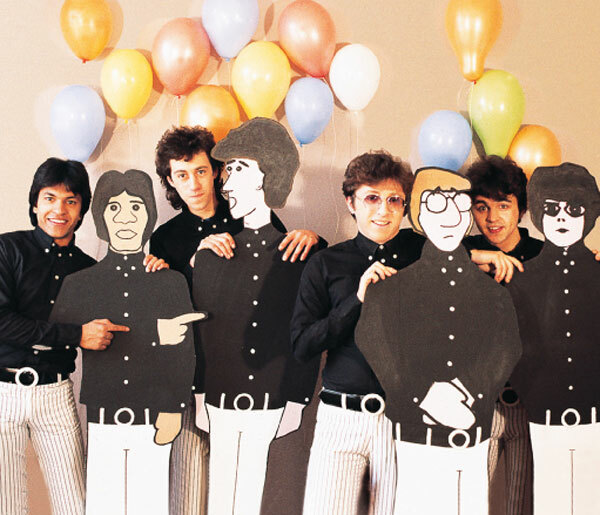 What you see before you is a recent edition of my WFMU – Give the Drummer Radio show Testify! which I thought would be of special interest to Iron Leg-gers. Since WFMU is in the midst of it’s 2019 fundraising marathon, and Testify! is part of that effort, I thought that this week, I would use Iron Leg and Funky16Corners to push some traffic in that direction. This particular episode of Testify! was a major labor of love, something that I’d wanted to do for a long time, and the assembly of which underwent many revisions over the course of several weeks (in an attempt to get it just right). There are some faves here, but also a very large helping of deep cuts, from the worlds of rock, pop and soul, all in service of paying tribute to one of the all time great songwriters and record makers. So, give it a listen, and if you dig it, and/or WFMU, click on this link (or on the WFMU logo above), DONATE and send some money their way to keep the greatest station in the nation up and running for another year. That said, I will see you all next week. The record I bring you today is a testament to always grabbing the album attached to a big hit (whenever possible) so that you might luxuriate in the neglected LP-only tracks. 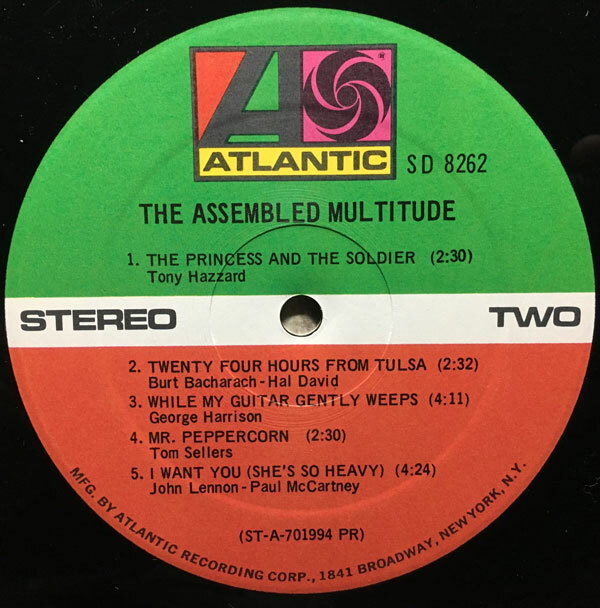 In the case of the Assembled Multitude, which had a big hit in 1970 with their version of ‘The Overture From Tommy’, the rest of the self-titled album is pretty interesting. The album, composed mostly of covers (two Beatles, two CSNY, and some others) is – as instrumental/easy records go, if not ambitious, not unpleasant either. 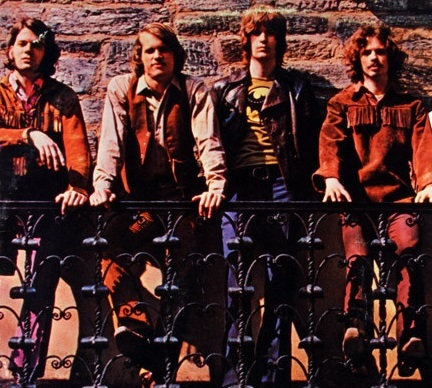 The group was the work of Philly composer/musician Tom Sellers, who had worked with John Madara, and was a member of Daryl Hall’s early group Gulliver (who did a cool pop LP for Elektra in 1970). The track I bring you today is a Sellers original, ‘Mr Peppercorn’. The track is, if not entirely Beatle-y, at the very least Beatle-adjacent, sounding like a pile of Beatle scraps stitched together by someone with a taste for light classical and progressive rock. The song floats along on a whimsical, yet vaguely sinister theme, with basic rock instrumentation laid over a bed of strings. I dig it a lot, and if you have a taste for the more interesting side of instrumental pop, this is definitely worth a listen.